When Uday Shankar, President of The Walt Disney Co Asia-Pacific and Chairman of Star and Disney India, introduced Hotstar to Disney's investors at the Investor Day conference in Burbank, he exuded pride in sharing how the platform had reached peak engagement of 300 million monthly active users, as per latest data. The game is only going to get bigger with The Walt Disney Co's $71 billion deal with 21st Century Fox, as part of which it now owns Indian TV giant Star. "First and foremost, we were ahead of the curve. When everybody was dismissing India as a data dark market, we anticipated the impending shift (in data cost, smartphone penetration, and online video consumption) and built Hotstar. We also kept mobile, and in particular, Android at the centre of our strategy, and created an app that was high quality and feature rich but which was also extremely light and nimble," Shankar said. India, he said, has become a magnet for global media and content companies, and Hotstar, launched in early 2015, was currently in the "pole position". There are already over 30 OTT platforms vying for viewers' attention in India, where big players from the film world have stepped into the game via individual apps or content production. Over 1,200 hours of fresh original content was created for OTTs in 2018. Netflix CEO recently said that he finds India a "competitive" and "exciting" market, and efforts have been directed towards amping up the platform's India original slate. 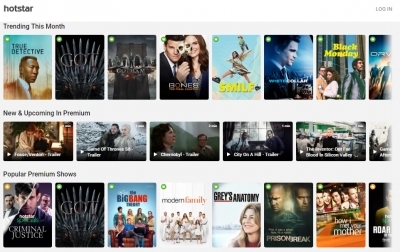 Hotstar offers an annual pack for Rs 999 for all sports and American shows and movies. The same plan is available monthly for Rs 299. And then there is Hotstar VIP -- for access to Hotstar Sports, Hotstar Specials and serials before TV -- at Rs 365 annually. Amazon's Prime Video is available for Rs 129 per month and Rs 999 for one year.